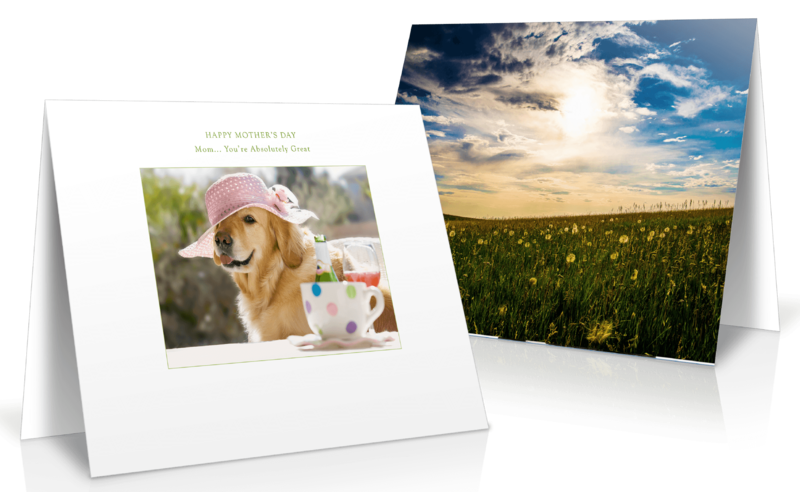 Custom greeting cards are perfect for amateur photographers and professional designers. Just upload your photos or artwork (must be at least 300dpi) for any occasion. Order as many lots or versions as you want, though we require a minimum of 25 cards per lot or version. Order flat or folded. Holiday, Graduation, Wedding, Anniversary, Love, Personal, Corporate, Special, Announcement and Thank You Notes. Be as creative as you want with your greeting cards; let them reflect your personal or company’s style. Be humorous, professional and relaxed. Let your greeting cards represent you. Print greeting cards online with vibrant color photos, fast and easy ordering, plus a satisfaction guarantee. Order on top quality premium 9PT or 12PT Matte Cover or 10PT, 12PT or 14PT. Gloss Cover 12PT C1S (Coated One Side) can be UV coated to give that luxurious high gloss finish. They are perfect for attracting attention. Can I Order Multiple Versions/Lots? Do you have multiple greeting card designs you want to print? You can order as many versions or lots as you want! Just select the number of lots/versions in the pricing tool and upload your print-ready files in checkout. We require a minimum of 25 quantity total for your order. Order flat or folded. To create a great professional, all-purpose greeting, thank you or note card; select a group photo of your family, friends, employees, a photo of something of interest in your community, a scenic picture, one of your most popular products or whatever you want to share with the recipients. Or simply add or use a design, message, logo, or your company’s name on the front cover to make a generic card that can be used for any occasion. Leave the inside blank for you to write a personal message or handwrite the message. Holiday cards are an inexpensive and friendly gesture that you can send to friends and family or they will help strengthen your business' customer relations. People welcome your holiday wishes and many display holiday cards on mantels, desks, and tables. Full color printing makes your card stand out. This is a great way to thank customers for their business during the holidays. Greeting cards are a common tradition for business and personal use. Personalized cards are a popular way to say thank you, set up a meeting, or to just send a friendly message. Greeting cards are a fun way to keep in contact with friends, family or customers without sending a direct marketing piece. Whether you need holiday cards or a generic greeting card, make sure you send it in style! Cards are becoming more popular as a way to make money for schools. Pictures of the school, events, historically related school things, mascot pictures, teams, clubs, pictures of the community, etc. can be produced and sold by students at events, the school book store, etc. The are beautiful, bundled well and have crisp color. was wary to print online without physical proofs but the cards turned out GREAT! high quality, great color, and consistent! scoring was strong and folded perfectly even. will be using this service again! Fantastic! The quality exceeded expectations. Will definitely be coming back. They were super professional ! My cards look great! Would definitely recommend! Always great service, great products, and reasonably priced. Highly recommend Printing Center USA! Very happy with the sample pack to final results. Paper names did not match so should be adjusted. The interface is easy to use although I wish I did not have to go all the way back to the beginning screen each time since I did a number of orders of the same card size and thickness and I could find no way to add additional to my cart without going all the way back to the beginning screen. Finally, I wish I had received a shipping notice. The last time I checked the status simply still said “approved”. It never switched to say In Print or In Production or Shipped to let me know they were en route. They just appeared. There was also no packing slip with the order. I was very happy with the items though and am simply giving feedback as to how communication could be improved. Thanks again. Another superb job! My Cards turned out EXCELLENT, but they would not have if it wasn't for the excellent service at Print Center and especially Mary. I first sent in the wrong size file for the greeting card and half of it would have printed on the back side. She emailed me and asked if that is what I intended. Then she proceeded to work with me through 3 more wrong files I sent. The patience and quality control is a rare find. I am so thankful and happy to now have beautiful cards printed in the USA and for a very good price. Another superb job by the PrintingCenterUSA Team. Excellent customer service. Excellent consistency and color reproduction with printing. After 3 other printing companies failed with my project PrintingCenterUSA.com came through with flying colors and did an excellent job. Hi quality greeting cards and calendars that shipped quickly. Very happy with the customer service too. Highly recommended. Printing Center always does a great job for us. Our latest job was thank you cards for our non-profit, and they were delivered on time, in perfect order. Reliable and dependable.